The New Visions Award, established this year, will be given for a middle grade or young adult fantasy, science fiction, or mystery novel by an author of color. The Award winner will receive a cash grant of $1,000 and our standard publication contract, including our basic advance and royalties for a first time author. The deadline this year to submit manuscripts will be October 30, 2012. Lee & Low Books is known for striving to give authors of color a chance to have their voices heard. This New Visions award is modeled after their New Voices Award for picture books, which was established in 2000. If you want to get in on more I'M BORED fun, MiG Writer Christina Farley has an interview with Debbie Ridpath Ohi over on her blog, Chocolate for Inspiration, with another chance to win! (Entry deadline is September 19th). I’m working on a new non-fiction book for my publisher. This one is on electricity and while most of my previous books incorporate experiments and inventors, this is my first all-out-science title. It’s pretty exciting. But it’s also a little challenging. Electricity is *not* something I know a lot about. I’m having to do a good deal of research to make sure I’m getting facts right and picking all the important information to include in the tight format. Typically, after I’ve researched something I call my dad (who does know a lot about electricity) and explain what I've learned to him. Articulating things out loud before I commit words to paper helps me. I was reminded of this quote yesterday when I read Andrea Mack’s blog about writing the dreaded synopsis. Only instead of not understanding our books well enough, I think the problem with writing a synopsis is that we know our books TOO well! We keep wanting to cram in all the little details and the results aren’t pretty. It’s a challenge to step back and find those bare bones. 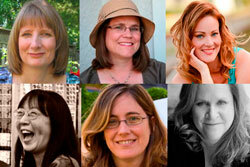 Andrea shared a link to a post by Susan Dennard. I read it and bookmarked it and I highly suggest you go do the same. It's an extremely helpful post and includes a template for a 1 page synopsis. I think that when we find these little gems we just gotta share them. Hope you find them as helpful as I did! Anyone else have a tip about writing a synopsis or a link you'd like to share? I don't know about you, but I've always thought potatoes were kind of a boring vegetable. So how surprised was I when I went into my kitchen on the release day of I'M BORED, only to find....a potato celebration party! I think seeing a fellow potato illustrated in a picture book went to their heads...or their hats, anyway. So I was wrong. Potatoes are not boring. Still don't believe me? 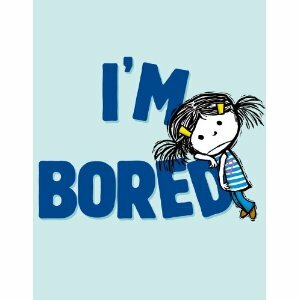 You'd better check out I'M BORED, and see for yourself. Or tweet about our celebration and mention it in your comment. Our contest closes Sunday September 9 so make sure you get your entries in! 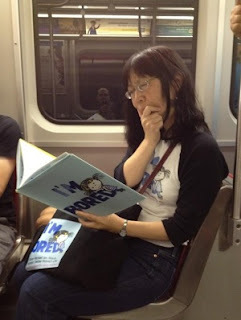 To find out more about I'M BORED and Debbie Ridpath Ohi's illustrations, visit her I'M BORED Scrapbook. Day 3: The Celebration Contest Continues (and is not boring)! 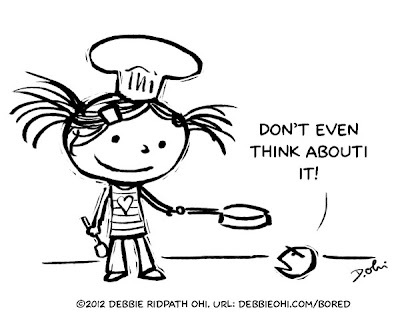 Look at how expressive Debbie's illustrations are! This is the most fun looking bored kid ever. Don't you wish you could give this book to a bored kid in school? If you win our giveaway contest, you can give I'M BORED to that kid suffering through long division. Or keep it for yourself, which is what I'd probably do. I mean, school is such a unique combination of boredom and enforced sitting and staring. Who'd want their kid to miss that feeling? 1. Draw scribbles while you look at teacher. Make scribbles into portraits when your teacher looks away. Someday you may be as good as Debbie! 2. Recite the states in your head, along with what you'd rather be doing in them. Alabama: eat barbecue. Alaska: see a glacier. Don't forget to eat a potato in Idaho. 3. Give your teacher a potato name. Like Mr. Russett Spuds or Ms. Frenchie Eyesprout. Uh, keep it to yourself. Unlike the news about our giveaway contest. Spread that everywhere like magically non-caloric butter on a baked you-know-what! 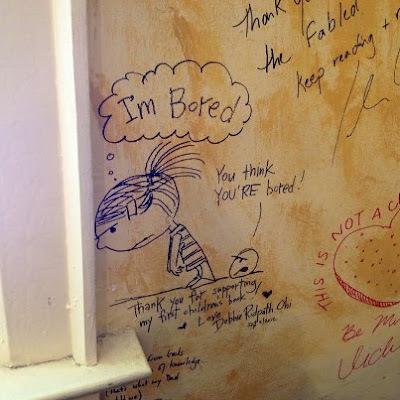 Just comment and you're entered for a free copy of I'M BORED, written by celebrity author Michael Ian Black. Tweet about the contest and tell us in your comment, and your entry counts double. I promise, you won't be bored. Congratulations, Debbie and Michael!! I’m so excited to be a part of the celebration for Debbie’s first book, I’m Bored!! I remember when Debbie first started working on the illustrations for this book and I can’t wait to get my hands on a copy. Too bad I can’t win our contest, but YOU can, all you have to do is comment on our blog sometime this week. If you tweet the contest and tell us, we’ll give you another entry. Slice potatoes as thinly as you can. If you don’t have a slicer, just do your best to keep the slices uniformed. Rinse slices with cold water and pat dry. This is an important step so don’t skip it. Working in small batches, add potato slices to oil and heat until golden brown. Use the spoon to occasionally flip the chips so they are evenly cooked. I know from experience you’ll be tempted to start making bigger batches but resist that urge. Bigger batches won’t cook as evenly. Carefully spoon out chips (let oil drip out of slotted spoon) and lay them in a single layer on paper towels. While chips are still warm, sprinkle with salt. You can also experiment with other spices. We’ve tried pepper, vinegar and salt, and cinnamon. Tip: it helps to have an assembly lines of sorts. My kids and I set up a system where I cook, my son sprinkles the salt and my daughter carefully pours the batch that’s ready into a bowl. Check out what Publisher's Weekly has to say about I'M BORED here. 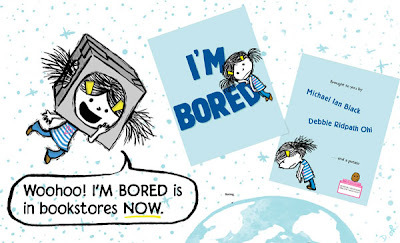 Happy Book Birthday to I'M BORED! Today is a big day here at the MiGs. 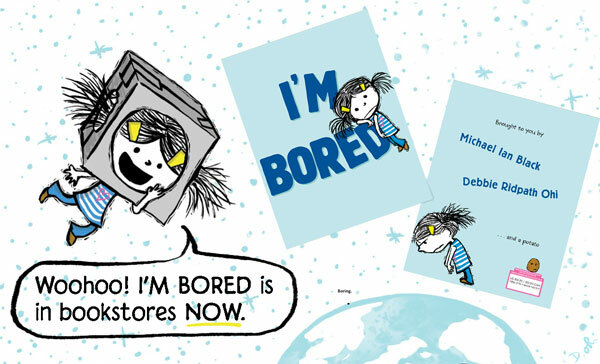 I'M BORED, written by Michael Ian Black and illustrated by our very own Debbie Ridpath Ohi, is released today! 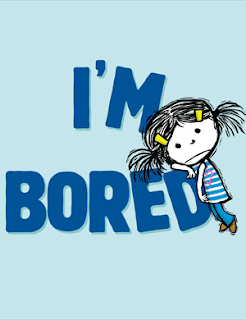 To celebrate the release of I'M BORED, all week here at the MiGs we will be talking about what makes us bored or something related to I'M BORED. And for every comment you post, you will automatically get entered to win a copy of I'M BORED! Tweet about this contest and tell us you did so to receive an extra entry. You can comment every day for more entries. The other day, Debbie released her homemade book trailer (which is totally awesome) and I watched it while my boys were in their rooms finishing their homework. After I watched it I knew my boys would LOVE it. So I had it all set up and I waited. Because I knew, KNEW what my youngest would tell me the moment he walked out of his room (because he's been saying all the time lately). Sure enough, he shuffled out and said, "I'm bored." I said, "Really? That's great!" That was when he looked at me oddly. "Because I have the perfect video for you to watch." And he loved it. In fact, both boys liked it so much we had to watch it over and over and over again.